Democracy Now! 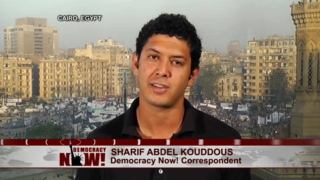 interviews Sharif Abdel Kouddous on the decision of the Egyptian judges to go on strike against the decrees of fundamentalist president Muhammad Morsi. Plus: BREAKING NEWS: The most senior Egyptian justices of the Supreme Judicial Council have overruled their colleagues and will assign personnel to oversee the December 15 referendum on the constitution. The members of the unofficial Judges’ Club had earlier announced a strike and said they wouldn’t oversee the referendum vote (as is required by law).